What Of Walker’s Win In Wisconsin? Wisconsin Governor Scott Walker became the first American governor to survive a recall election last night. In a rematch of a 2010 contest, he gathered more than 53 percent of the vote and beat Milwaukee Mayor Tom Barrett — by a margin slightly better than that Walker achieved in 2010. As is often the case with such events, people want to draw sweeping inferences from this one event. We’ll see many articles about what this means for the future of the public employee unions that brought about Walker’s recall election after he pushed through reforms of public employee collective bargaining rights, for Republican governors in other states, and for President Obama’s reelection prospects. It’s a natural human tendency, I think, to want to see a broad pattern in isolated events — but often those perceived patterns don’t really exist. Public employee unions aren’t going away. They lost in their bid to unseat Walker in Wisconsin, but they defeated another public employee collective bargaining law in Ohio. Where’s the pattern in that? Members of public employee unions, like other members of private-sector unions, believe in collective bargaining rights. 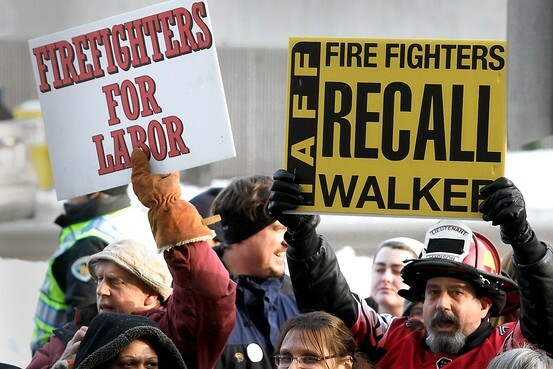 One reason they objected so strongly to Walker’s reforms is that they believe the reforms improperly interfere with fairly gained, bargained-for rights and benefits, won after hard-fought negotiations in which union members may have given in on other issues. In their eyes, the fact that taxpayers and people in the private sector might view those rights and benefits as overly rich is irrelevant, because they are stalwart believers in the collective bargaining process that achieved those rights. 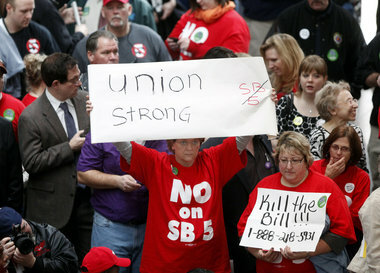 Public employee unions in other states aren’t going to roll over just because the unions did not prevail in Wisconsin. If they did, it would undercut the entire idea of public employee labor unions. I also doubt that Walker’s win is going to charge Republican governors in other states with enthusiasm for taking on public employee unions and pushing sweeping reforms — at least, no more so than is absolutely necessary to achieve balanced budgets and govern responsibly. Walker prevailed, but his actions precipitated a bruising political battle, sidetracked his term with a recall campaign and election, and ultimately resulted in more than $60 million in campaign spending, much of it by organizations outside of Wisconsin. It’s therefore no surprise that Walker was playing the pipes of peace after yesterday’s result. Although politicians love to talk about “fighting” for voters, one way or another, most of them are inveterate compromisers who aren’t looking to pick a knife fight, especially when they know they can’t count on advocacy groups supporting their efforts to the same extent that occurred in Wisconsin. As for President Obama, he largely stayed out of the Wisconsin recall election fray and will be able to depict it as a one-shot, one-state result that doesn’t have broad national significance. How do you glean national trends from an election rematch that produced pretty much the same result as the initial 2010 election between Walker and Barrett? If there is a lesson there, it is that voters stuck with Walker, despite all of the controversy and protests, in a contest that involved extraordinary spending by both sides. But how many of those Walker voters cast their ballots because they object, in principle, to recall elections under such circumstances? How many were motivated by special concerns not found in the national electorate? I’m just not convinced that the Wisconsin results in June are going to predict much with respect to national results in November. The Wisconsin recall election is an interesting mid-year event that may be the start of a trend — or it may not. Today President Obama rejected a proposal to build the Keystone Pipeline. It is one of those decisions, I think, that carries a deeper message about our country, its leaders, and where we are headed. The proposed pipeline would run 1,700 miles, carrying oil from Canada to the Gulf of Mexico. It was opposed by environmentalists, who hate the idea of a pipeline crossing the heartland and argue that it would invade sensitive environmental areas in Nebraska. It was supported by business and labor unions, who say it would be like a colossal public works project — except the $7 billion cost wouldn’t be paid by the government, but by the company that wants to build the pipeline. The pipeline issue posed a difficult political choice — so the Obama Administration punted and blamed Congress. The State Department said that the denial was due to Congress imposing an unreasonable 60-day deadline on the Administration’s decision on the project. Congress, of course, says the 60-day deadline was necessary because the Administration was dithering and proposed to delay any decision until after the 2012 election. The story linked suggests that the Administration’s decision today was motivated by various carefully weighed political considerations. 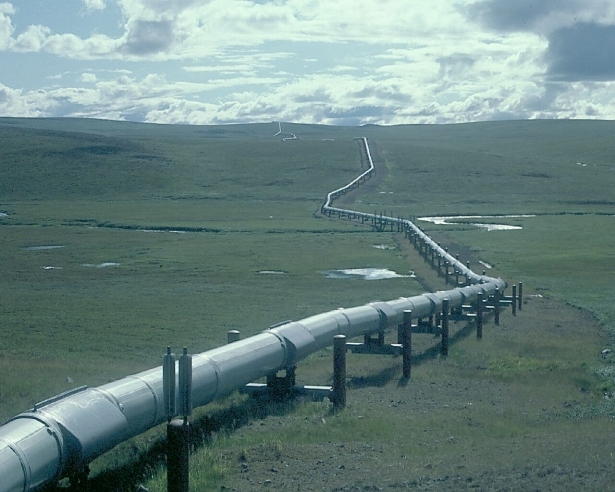 Obviously, environmental issues must be considered in deciding where the pipeline should go — but why should they quash it altogether? It already is designed to run through the sparsely populated central region of the United States. We need to remember that we live in a country that is criss-crossed and tunneled through with pipelines, power lines, generators, underground storage tanks, highways, railroad, and other delivery systems. I’m confident that the experts can find an appropriate location for this pipeline and install the protections needed to make it as safe as is reasonably practicable in an uncertain world. America used to be fabulous at this type of massive project, like the transcontinental railroad, the Hoover Dam, the Panama Canal, or many others. Those projects had broad political support because they promoted development and commerce. Does anyone doubt that Democratic Party icons like Franklin Roosevelt, Harry Truman, and Lyndon Johnson would approve this pipeline? Conversely, does anyone think the interstate highway system could have been built so speedily if the current regulatory morass that has grown up around consideration of environmental issues existed in the ’50s and ’60s? Consider that, the next time you drive on our interstates and see the hills that have been sheared off or tunneled through so that you can get from point A to point B at 65 mph. So now we’ll wring our hands, and hire consultants, and do impact studies for months and years more — all the while leaving people without a job unemployed when they could be working, leaving our economy moribund when it could be helped, and leaving our reliance on energy from volatile regions unchecked when it could be reduced. Does any of that really make any sense for our country? America has become like Gulliver, the slumbering giant tied down by thousands of Lilliputian restraints and political considerations and regulations and standards and policies and statutory notice and comment requirements, to the point where it is unable to move. We need to break those ties and start moving again. I don’t mind the vulgarity and martial imagery — anybody warming up a crowd at a union event on Labor Day can get carried away, I suppose — but I’m not sure what “war on workers” Hoffa is referring to. Presumably he is talking about the efforts to limit collective bargaining rights for public employees in states like Wisconsin and Ohio. For the most part, however, the agenda of the “tea party” — if such an entity can even be said to exist — seems to be a pro-worker agenda. The “tea party” element wants to restrain the growth of government, keep taxes low, avoid unnecessary regulations that restrict economic growth, and let private enterprise develop and create jobs. What is so “anti-worker” about that? 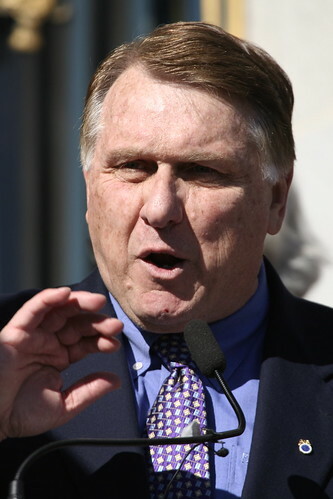 Many union leaders, like Hoffa, apparently equate a “pro-worker” agenda with a “pro-union” agenda. Anybody who pushes a “pro-union” agenda necessarily supports government spending, government growth, and government regulation, because public employees have been one of the few growth areas for unions in recent decades. If you follow a pro-worker agenda, on the other hand, you want to see jobs created, whatever those jobs may be. How many more people — Teamsters included — would be employed on this Labor Day, for example, if our government hadn’t imposed a moratorium on certain oil drilling and imposed restrictions on our ability to exploit our reserves of oil and natural gas? Where Must Boeing Build Its Dreamliner? At the oft-ignored intersection of politics and labor law, an interesting tussle is brewing. At issue is whether a federal administrative agency can tell Boeing where it must build its 787 Dreamliner. On April 20, the National Labor Relations Board filed a complaint against Boeing Co. The NLRB contends that Boeing’s decision to put its Dreamliner assembly line in South Carolina, rather than in Washington with other Boeing production facilities, constituted unlawful retaliation against unions that have struck Boeing facilities on several occasions over the last 25 years. As a remedy, the Board asserts that Boeing should be required to move Dreamliner production from South Carolina to Washington. The NLRB’s action is seen as an outrageous power grab by politicians in South Carolina — which is a right-to-work state — and Congress will hold hearings on the matter. Boeing, which has sunk lots of money into its nearly completed factory in South Carolina, says its decision on where to locate the plant wasn’t retaliatory. We don’t yet know what really motivated Boeing’s decision to put its production line in South Carolina and whether retaliatory animus played a part. However, an administrative agency asserting that it has the power to order a company to move an entire production line from one state to another is a breath-taking exercise of federal authority — one that should give us all pause. Should unelected administrative agencies be empowered to second-guess where companies decide to do business? And if moving production facilities from one part of America to another can be characterized as anti-union retaliation, couldn’t the NLRB also claim that moving production facilities overseas to low-wage, non-unionized countries is retaliation as well? Does Limiting Public Employee Collective Bargaining Save Money For State And Local Governments? In Wisconsin and Ohio, new Republican majorities in state legislatures, and new Republican governors, have modified public employee collective bargaining rights and argued that it is part of an overall effort to bring state and local government budgets back into balance. Democrats have responded that the budget control argument is a bogus fig leaf and that the real motivation for the Republicans’ actions is union-busting, pure and simple. It therefore is interesting that in Massachusetts — Massachusetts! — the House of Representatives voted overwhelmingly in favor of a bill to restrict the ability of municipal public employees to collectively bargain about health care benefits. Moreover, the House effort was led by Democrats, who argued that the changes will help struggling cities and towns. Indeed, the Democratic Speaker of the House contended that the changes would save cash-strapped municipalities $100 million and allow them to maintain more jobs and provide more services. The Massachusetts initiative still has to pass the Senate and be signed by the Governor, so it may well not become law. Still, the fact that Democrats in the Massachusetts House supported such a measure on budget grounds seems like a powerful argument for the proposition that modifying public employee collective bargaining rights is a legitimate way to achieve significant savings in government spending. If Democrats have accepted that argument in Massachusetts, how can Democrats in Ohio and Wisconsin contend that similar efforts in their states are motivated wholly by partisan politics and mindless anti-union sentiment? Yesterday the Cave Dweller and I went to lunch at a nearby sandwich shop. As we were eating we noticing people with union t-shirts and signs heading toward the Ohio Statehouse. After we finished our lunch we decided to take a lap around the Statehouse to see what was going on. It was a journey well worth taking. In Ohio, as in Wisconsin and other states, the ability of public employees to engage in collective bargaining is being revisited by the legislature, and the pro-union forces were having a big rally. As we approached the Statehouse along Third Street, buses were rolling up and discharging union members who were joining the rally. The crowd, probably numbered in the hundreds by that point, began a spirited “Kill the bill!” chant. Union members were handing out fliers with the schedule for the day. The TV trucks were there, with their satellite dishes extended, and we ran into an NPS radio reporter who was happy to have some good audio to use in her report. As we turned the corner of the Statehouse, we saw more union members heading toward the rally. At the corner of Broad and High we watched as a firefighters bagpipe and drum corps marched by playing some unknown tune, their kilts flapping in the cold winter wind. A policeman who was holding back traffic gave a high five to one of the marchers. By the time we got back to the firm, a helicopter — probably from one of the local stations — was hovering overhead to get some crowd shots. And when I drove home that night I heard that the rally would be capped by a lawsuit contesting the decisions on how many of the rally attendees were permitted to enter the Statehouse. Regardless of your position on the issue at hand, you had to be proud. What could be more American that concerned citizens petitioning their government and making their views known to their elected representatives? Our country would be a better place if more of our fellow citizens took a direct interest in what their governments are doing — and perhaps marched down to the Statehouse, kilted or not, to let their representatives know that they are paying attention.